Click on the map (or use the links above) to go to that area. We arrived in Tahiti in August of 2003, and left the boat there for five months while we flew back to the States. When we got back in January, we spent two months hopping back and forth between Moorea and Tahiti, doing quite a bit of diving. With the press of visitors, we sailed to Huahine, then stayed for a few days before sailing to Raiatea. We had a night or two there and at Tahaa. Then to Bora Bora for a week, and back to Raiatea. We stayed in Raiatea for about a month, including both Jon's and Amanda's birthdays. 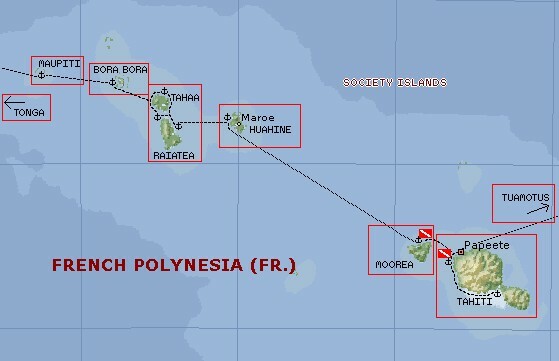 Then to Bora Bora for a night, and a week or so at Maupiti before jumping off for Tonga.